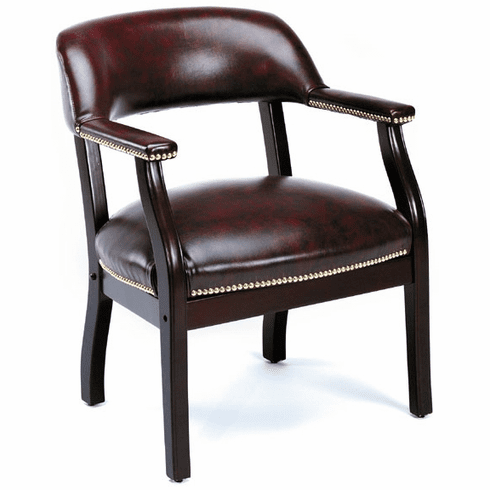 This elegant captain's chair from Boss features classic traditional styling and charm. Features hand applied individual brass nail head trim all the way around the armrests and bottom of the seat and a no-sag spring seat. The sturdy hardwood frame is finished in a rich mahogany. Available in your choice of soft durable oxblood or black vinyl and also your choice of casters for mobility or without casters for stationary applications. Dimensions: Seat size: 22'W x 21"D. Back size: 24"W x 12.5"H. Seat height: 18.5"H. Fully warranted from Boss Office Products. This chair normally ships within 2-3 business days from our GA or CA warehouse.